Legendary film director and writer with a filmography about a mile long, Blake Edwards has died at the age of 88. 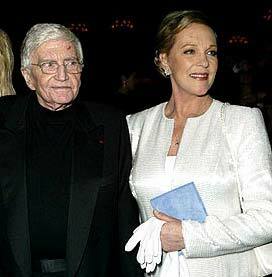 His five children with wife, actress Julie Andrews were all at his bedside when he passed. They haven’t revealed his cause of death yet. Edwards’s distinguished career began in the 1940s as an actor but soon turned to writing radio scripts at Columbia Pictures. He used his writing skills to begin producing and directing, with some of his best films including: Experiment in Terror, The Great Race, and the hugely successful Pink Panther film series with the British comedian Peter Sellers. Often thought of as primarily a director of comedies, he was also renowned for his dramatic work, Breakfast at Tiffany’s and Days of Wine and Roses. Our thoughts and prayers are with the entire family during their time of loss.